Selecting a book editor is like choosing a partner. They have to complement you; they have to be your strongest critic and your most ardent supporter. And you both need to have the same end goal in life- getting your manuscript ready for publication. It is vital that you learn all the levels of editing before you approach a book editor so you can ensure what you need is covered in their services. Book editors often offer four types of services. Developmental editing is looking at the story, the characters and the plot in terms of big picture. If those are well etched, your book is on its right path. Line editing or substantive editing is reading every line, removing or changing them so the entire book sounds good. This is a stylistic form of editing. Copy editing is often clubbed with line editing by editors, as it involves correcting punctuation, grammar and spelling. Proof reading is often the last level of editing when it’s all ready and just needs to be given a check for wrong spellings, facts or consistency. So now you know what a book editor does, all you need to do is find the right book editor for your book. 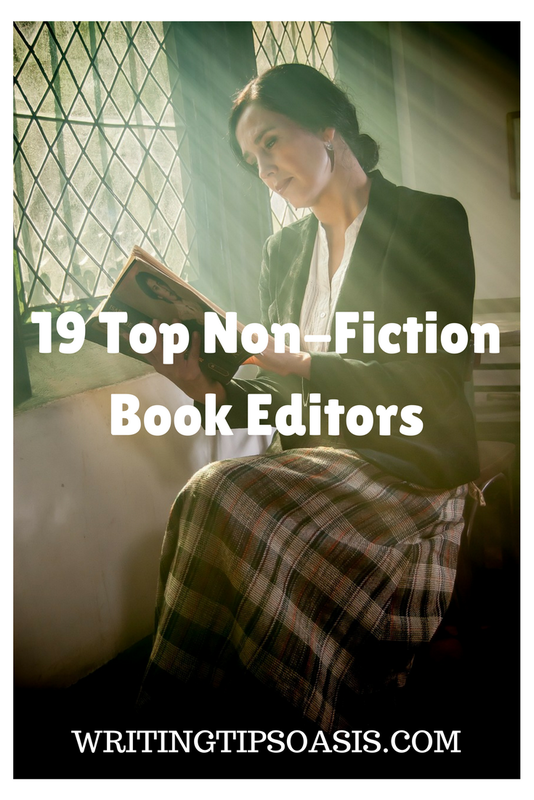 There is no need to panic because we have compiled a list of 19 top non-fiction book editors to help authors and writers. Having 5 decades of publishing, Arnold Dolin has written and edited extensively about various topics in non-fiction. Arnold has also worked as a publisher so he knows what publishers are looking for in a manuscript. He has worked with talented writers from all over the world and is always on the lookout for the next bestseller. Topics such as politics, social issues, culture, business, memoirs and biographies interest Arnold. You can contact him via email to get a quote and learn about availability. C.S. Lakin is a successful and professional non-fiction book editor. She knows the importance of getting your book critiqued or reviewed by a book editor to get an unbiased opinion about your book. You can approach her to edit or just critique your book and project which will enable you to view it with clarity. She also does private consultations for authors who believe they need to connect on a one-on-one basis. Her services include proof reading, content editing and manuscript critique. You can fill this form to contact her and know more about services. Mikaela Pederson has been an editor for 5 years, a time during which she has helped first time writers and previously published authors have a manuscript worth getting published. Working in tandem with authors, encouraging open conversation rather than her ordering or making changes, Mikaela edits fiction and non-fiction. She connects with the author and instead of changing the story she uses the writer’s instincts to shape it and give it a distinctive voice. She offers a free sample edit so all you have to do is write to her and tell her a little about yourself and your book. Liz Dexter is a writer and editor based in Birmingham, UK. Using books and information to teach readers about business, marketing and employment, Liz edits and proof reads novels, marketing materials and dissertations. She knows the value of honesty and experience so she tries to discuss relevant issues like grammar, tone and flow through her blog. You can contact her by filling this form or send her an email at to learn more about her services and eligibility. Philip Athans has been an editor for 30 years which has led to him working with innumerable authors on successful projects including bestsellers. The great thing about Philip is that he won’t just assess your book or writing but also reminds you what’s great about it and how your writing style can improve without changing your personality or compromise your beliefs. Philip edits science fiction and non-fiction. He also offers coaching services in case you’re stuck and need guidance. You can contact him via email at to discuss your project and get a rate card. Roz Morris is an author and editor who has previously worked with literary consultancies but now works on a freelance basis. Eager to work with both amateur and experienced writers, Roz enjoys the challenge of seeing a book through fresh eyes. She also teaches creative writing in London. She doesn’t encourage spoon feeding her clients or bullying them into following her recommended changes. Roz edits non-fiction, memoirs and fiction but is always open to new genres. She wants to work in a cohesive partnership with writers and offer them honest feedback about their manuscript. Write to her via email by telling her a little about you and your project. Victoria Mixon is a freelance editor of fiction and non-fiction. Handling limited clientele, she is a committed and persevering editor who treats her writers and authors honestly and efficiently. Because she picks few projects at a time, she requests interested authors and writers to know why they picked Victoria or why they wish to work with her. You can write to her via email to know more about the copy and line editing services she provides. Owner and founder of Barbara McNichol Editorial, Barbara has been editing books since 1994. Specializing in non-fiction, she has edited over 350 books. Whether you’re an amateur writer or a seasoned author, Barbara’s keen sense of clarity and writing can benefit you and your manuscript. Her passion of writing has led to her holding writing workshops and seminars for authors. Focusing on self-help, business, memoirs, spirituality, and blog posts and marketing materials, Barbara is based in Tucson. You can write to Barbara via email to learn more details about her editing services and prices. An enthusiastic editor of fiction and non-fiction, AJ Sikes is always ready to assist writers on their new project. Unlike some editors, AJ believes the editor’s job is to assist the writer in achieving his vision. Testimonials provided by previous clients give a glimpse of an editor who is kind with their words. AJ does developmental editing, substantive editing and copy editing. AJ edits non-fiction, history, cooking, education, US military and linguistics. Prices for all services are listed on this page. You can fill this form to get in touch with AJ. A writer herself, Kate Maloy knows the power of editing. Without the guidance of an editor, the writer will have a too long or too short manuscript full of grammatical errors and poorly styled writing. Non-fiction books need the right data, flow of topics and well researched content to make the book a viable prospect for publishers. Kate has edited non-fiction manuscripts before and enjoys working on topics such as history, education, architecture, business, research, textbooks and marketing. You can write to Kate via email and learn more about her services. Kathy has been an editor since 1982, first as a senior editor for a major publisher and later as a freelance book editor. In her position as a senior editor, she felt the need for quality freelance book editors that could help new writers and struggling authors ready their manuscript. Kathy is very frank about the fact that you can only hire a book editor you can trust so you need to be sure before you make that decision. She does not edit fiction and chooses to use her time and energy editing non-fiction, a genre in which she has specialized over decades. Topics such as health, science, wellness, travel, business, parenting, memoirs, spirituality and current affairs interest Kathy. Based in Illinois, Kathy can be reached via email if you wish to discuss her services and prices. Previously a consultant editor for Simon & Schuster, Lynn Curtis is a literary agent, writer and editor. Juggling three roles with ease, Lynn has been on both sides of the writer-editor relationship and can relate to the troubles faced by writers and authors while penning their novel. As a literary agent, she worked closely with publishing houses which strengthened her knowledge and skills about the things publishers look for in a manuscript. Often asked to step in by publishers and authors to edit their book, Lynn can count Hachette UK, Brown and Cornerstone Random House among her publishing clients. She edits fiction and non-fiction and works on a fee basis or hourly basis depending on your project and its needs. You can write to her to learn more about the services. The fees are listed on this page for your perusal. The founder and senior editor at Book Helpline, Judith Henstra has edited everything from fiction to non-fiction. Offering all services from editing, designing covers to publishing books via Amazon; Book Helpline is a full service team of experienced editors and marketers. Judith hasn’t forgotten her roots as an editor and continues to edit non-fiction and work with bestselling authors all over the world. Their editing services include story feedback, editing and proof reading. The prices for these services can be found listed on this page. You can fill this form or email Judith with details of your manuscript and she will get in touch with you. An editor at The Writer’s Ally, Vicki is the in-house non-fiction specialist. Her 20 years of experience often come handy as she works with authors trying to teach and engage readers in topics such as how-to, tips and tricks and resources for various situations and issues in life. She has edited almost 75 books in the popular ‘For Dummies’ series by John Wiley & Sons. You can contact Vicki by filling this form and receiving a free consultation for your manuscript. Susan Mary Malone thinks an editor’s job isn’t just to cut, trim and edit then leave the book but it means reading, researching, coaching, editing, polishing, proof reading and finally taking the completed manuscript to interested publishers and literary agents. She started Malone Editorial Services to offer her comprehensive and complete editorial services from the start to the end (it getting published) as a book editor, coach and mentor. She’s an award winning author, writing since 1993 and has condensed those experiences in blog posts and tips that can benefit new writers and authors. Contact Susan by email to learn about her prices for the services she offers. Jessi Rita Hoffman has been an editor since 14 years working with experienced authors in fiction and non-fiction. Offering developmental editing, copy editing, proof reading, coaching, ghost writing and critique, Jessi treats her clients like family which is seen in the glowing testimonials offered by her previous clients and writers. This Seattle based editor chooses genres like Christian, business, health, wellness, humor, travel, how-to and education. A published author and screenwriter, Jessi has edited books for Donald Trump, Michael Hurley and Dr Peter Field. You can contact her by filling out this form. Lorraine Reguly launched Wording Well as a way to use her talents in a beneficial manner. Listed as a copywriting expert by a website, Lorraine edits, writes and teaches English. Her blog and website has been awarded for the useful tips and information available for bloggers, writers, business owners and publishers. Her practical approach and extensive knowledge is evident through the testimonials offered by her previous clients. You can contact Lorraine in Ontario via email to know more about the editing services. Debra Hartmann of The Pro Book Editor is on our list for a reason. Experienced in US and UK styles of writing and editing, Debra also doesn’t provide you a standard package that may or may not match your requirements. Instead she focuses on your manuscript, what makes it unique; the level of work needed and gives you a quote based on those things. In a bold move, she has compared her prices with the industry standard to emphasize the savings an author would make should they choose Debra for their non-fiction book. She will send you a proposed editing plan and a free assessment of the stage your manuscript is in once you email her. You can either fill this form or follow the instructions outlined there to email Debra. Specializing in developmental editing, Chantel Hamilton of Afterwords Communications is a writer and editor. She steps in the early stages of the book to help the writer gather their thoughts and compose them in a manner interesting to readers and audiences. She has worked on non-fiction, business, memoirs, and self-help and how-to books in the past and is ready to explore more genres. Her books have made their way to the bestseller lists thanks to her expertise and sharp editorial skills. Email her to start a discussion regarding her editing services and your manuscript. That’s our list of top 19 non-fiction book editors. I would recommend you go with the editor you can trust. You can choose the right editor by giving them a sample and getting a free edit done. A lot of experienced and professional editors often agree for a free edit as it lets them see your manuscript and lets you get a sense of how they work. You can also go through their credentials and testimonials provided by previous clients to gauge their quality of work. The onus is on you for doing the research because you know the stage your manuscript is at and the amount of help required to complete, polish and ready it. Are you a non-fiction book editor? Tell us more about your services in the comments box below!